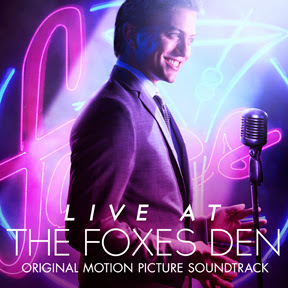 Lakeshore Records will release the LIVE AT THE FOXES DEN – Original Motion Picture Soundtrack digitally and Amazon On Demand on December 17, 2013. The soundtrack features eight songs performed and filmed live by the film’s Jackson Rathbone, who stars as a corporate lawyer who becomes a lounge singer. Also featured on the soundtrack are the film’s Jocelin Donahue and a duet between Rathbone and Elliott Gould. LIVE AT THE FOXES DEN tells the story of Bobby Kelly, a hotshot, young attorney, who becomes so disenchanted with his fast-track career that he quits and takes a gig as the house singer at an old cocktail lounge. As he becomes entwined in the lives of the unique staff and eclectic regulars at The Foxes Den, Bobby soon discovers what it is he’s truly meant to do. The soundtrack features classic tunes from such famed crooners as Frank Sinatra, Cole Porter and Jack Jones performed by Jackson Rathbone, who executive produced LIVE AT THE FOXES DEN. Rathbone is a multi-talented actor, singer and musician, who catapulted to fame as “Jasper” in the Twilight saga. The film marks the first time Rathbone combines his acting and vocal talents on screen, singing eight of the songs featured on the soundtrack and in the film. Lockwood Pictures, Diggit and Gravitas Ventures present LIVE AT THE FOXES DEN, in theaters and on VOD on December 6, 2013. LIVE AT THE FOXES DEN – Original Motion Picture Soundtrack will be available digitally and via Amazon on Demand on December 17, 2013.